will you both wear sarees one day and let me take some pictures, i asked. one of them grinned, the other did not. 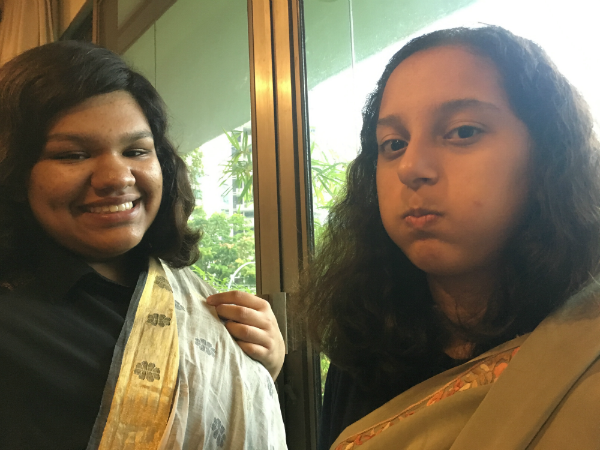 my sixteen year old niece loves to wear sarees, my almost fifteen year old daughter doesn’t. 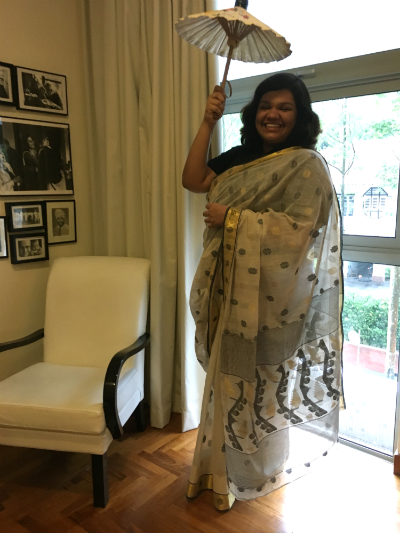 my niece held up the white tangail with gold border and black and gold motifs. it’s a beautiful saree, fine cotton, classy and cool. i think my mother picked it up from a shop in lake market in calcutta, almost twenty years ago. i remembered her wearing it. it’s your grandmother’s, i said. my niece was pleased. she’d wear that one. 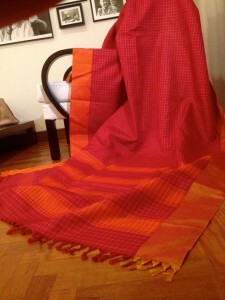 and how about getting one of grandmother’s sarees for my daughter as well? a pale olive green crepe with hand embroidered parsi border, as bengalis like to call it, lay right in front on the shelf. i had bought my mother a cobalt blue one with the same work from my aunt’s boutique. it had been rejected. she loved the work but it was too bright, whatever that means. 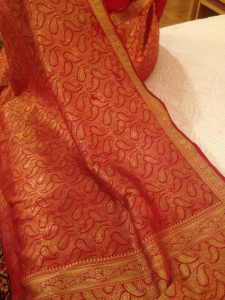 and so, my aunt had had this saree made. 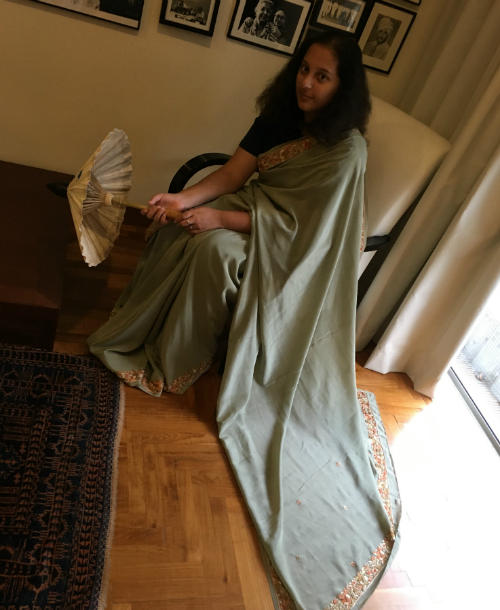 my mother had worn it at the lunch we’d hosted to introduce our daughter to family and friends when we took her to calcutta the very first time. she was seven months old. it had been a lovely afternoon. i pulled out the saree. the girls didn’t have blouses. 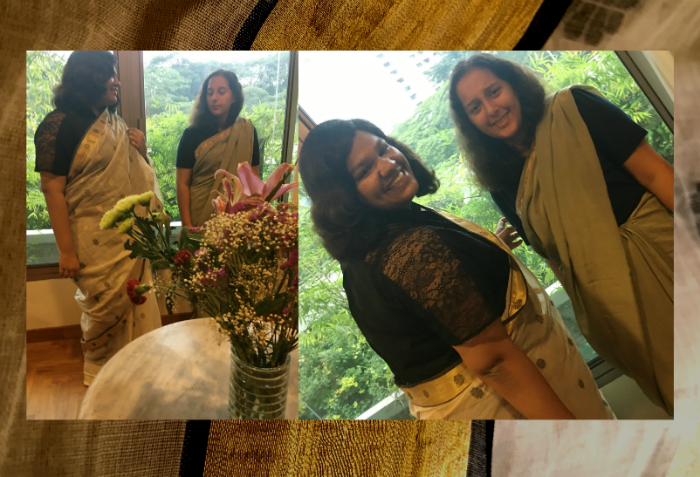 completely unhampered by the conventional way of looking at sarees, the dos and don’t, the musts and must nots, they wore theirs with black tops. my niece kept telling me to take shots of the lacy panel on her sleeve. my daughter tried to look a little above all this silliness, but she posed all right. i can’t quite explain what it feels like to see your children dressed in something that belonged to your mother. something with its own memories. 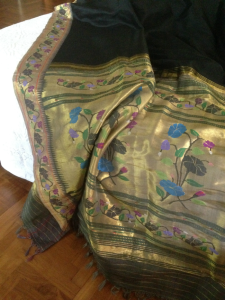 i have many sarees of hers and my grandmother’s. some are in tatters. but i keep them anyway. my mother started wearing sarees when she was thirteen. it was not a matter of choice, that was the norm. no one thought you had to grow up, get the right heels, the right figure, the right occasion to don one. and you went about doing all the things a young girl does: study, play, learn driving, cut class, whatever… in a saree. it was so much a part of her. 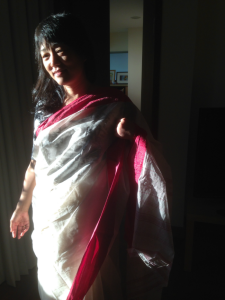 she would drape one in no time and throw the pallu over her shoulder casually. her blouses never matched. yet she always looked well turned out. even in her horrid nylon sarees. how can anyone look good in nylon? but my aunts, grandmother, mother, they all managed to. my models prattled away and posed around the house. they couldn’t care less whether they looked fat or slim, pretty or not, i was impressed with the ease with which they handled the unfamiliar six yards. i told them to smile sweetly at each other. a series of disastrous shots followed. two sets of memories now with these sarees. three girls and their shenanigans. i leaned forward and got a frame i liked, my daughter blew out her cheeks just as i clicked. 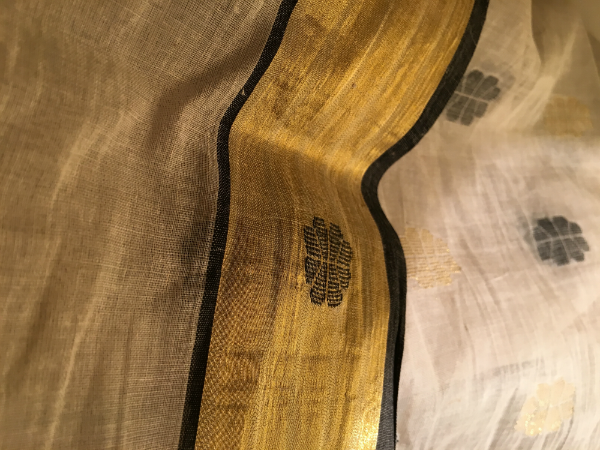 sarees tell stories | white tangail bought around 1996 from somewhere in calcutta; customised crepe saree with hand embroidered parsi border from raya’s boutique, calcutta, 2001.
it is a very pretty one. will tell the girls, they are thrilled with themselves anyway. glad you read, thanks. The awe that something that looks so delicate, so fragile has survived for so long. The years dont make sense… People have gone… but things remain… Things which one careless hand of a toddler can destroy, it seems. I remember, that growing up, my deepest wish was to wear my mom’s Pashmina shawls. Shawls that she had received from my grandma who was born and raised in Kashmir. 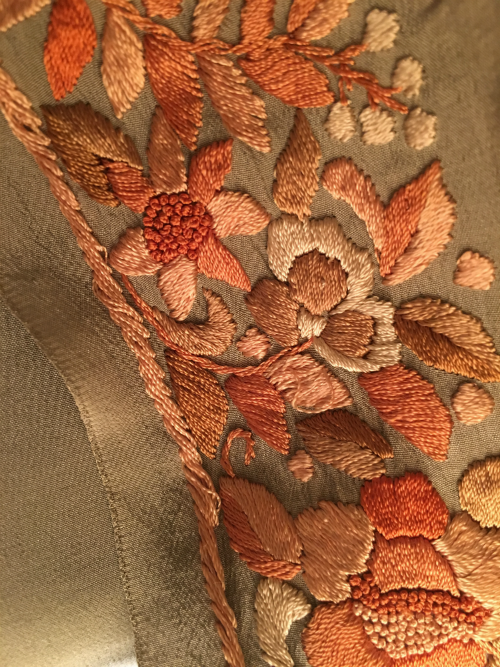 The embroidery was beautiful… The cloth… amazingly soft. And the stories that went with them. Of how it can at times take years to craft just one of them. The rarity of them. And the first time that I was allowed to wear one. I carried myself differently I think. I dont know how my mom felt… at that age I didn’t even wonder… but you just gave me a glimpse into her feelings. Thank you. 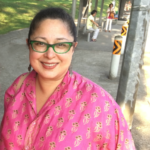 pashmina, shah toosh, jamewar, dohra jamewar… the words float around. my grandfather was in the government… as time went by, the base became delhi/shimla, and all the fascination with good shawls and things. 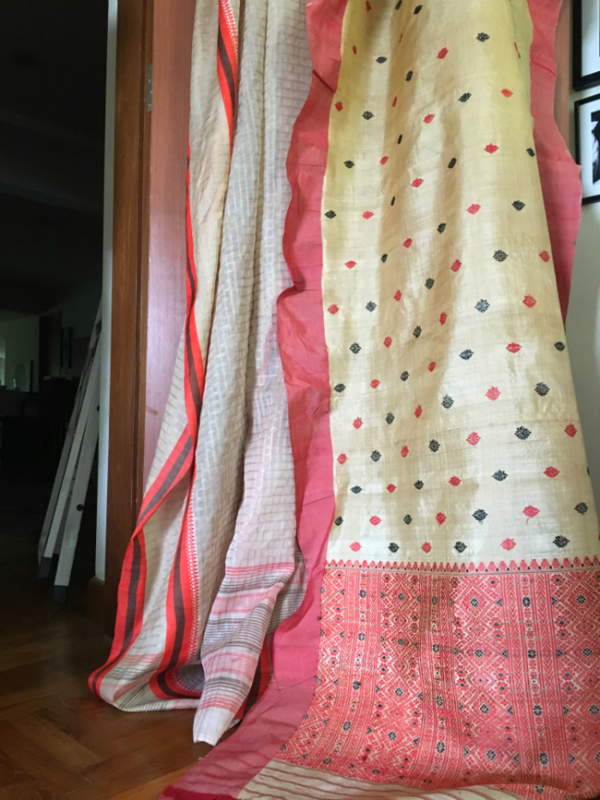 my grandmother belonged to a landed bengali fam… forever into finer things… i knew there was something rare and beautiful about shawls and even now i keep in touch with a shawl wallah from kashmir in the hope that someday, i’ll be able to ask him to get me a real dohra. 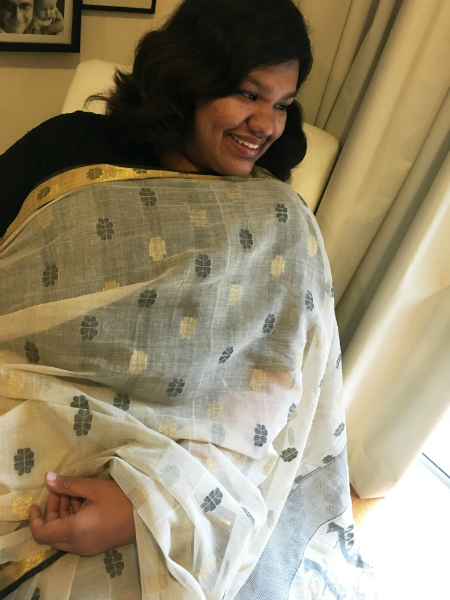 fine soft pashmina… wrapping a time that insists on going away. of course, you walked differently. 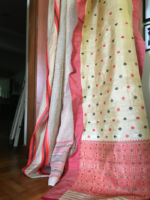 in hot sunny singapore, up on one of the shelves of the cupboard, a few shawls, not the finest and best and yet… among them the shawl from kashmir, work all over, both sides exactly the same, that my mother got when she got married… not pashmina, i think the base is a hardy ruffle, not sure. one of my abs prized possessions, taken with me whenever i go to a place where the degrees fall. kya yaad dilaya, sam. my mother was brutally snooty about shawls i think. she had to buy me a kashmiri one when i got married. that, hopefully, will be in my kid’s wardrobe some day. thanks for reading. so glad it reminded you of things. our fixed deposit of memories, no clever derivatives and things, a simple model. the banks that won’t fail. 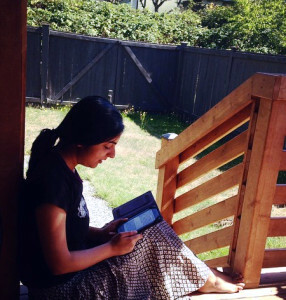 Dohra… I think we call it Durkha… Short for Do Rukha… Two sided. The material has to be a little hardier as that is the requirement of that style. 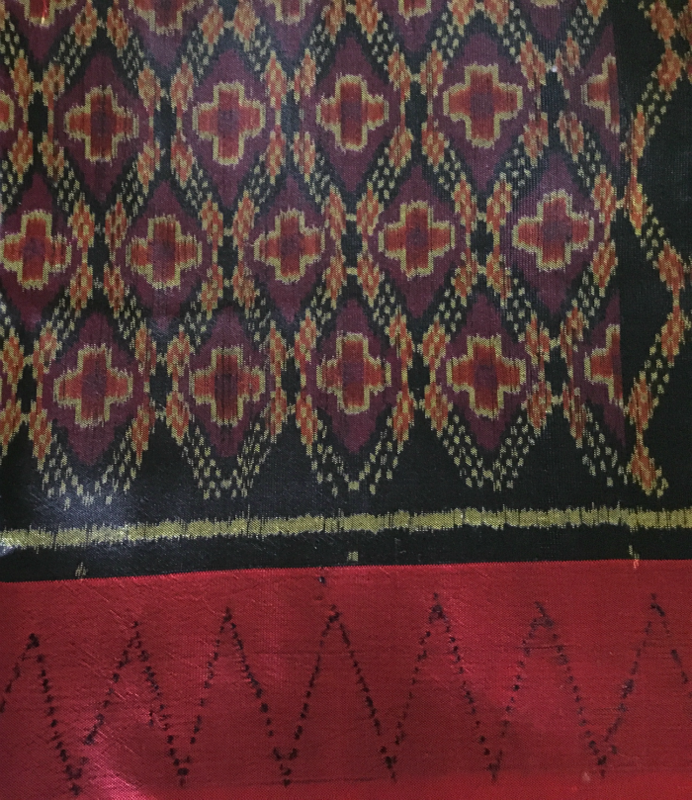 And Durkha Jaal (net)… what you called worked all over exactly the same on both sides… the colors can be different… And Durkha Jaal on Shah Toosh… The Holy Grail. Yeah… I am keeping an eye out for it too. Laughing. But the Shawl waalas that I meet, at least, dont have the same quality as yester years. Oh and my mom… she always ironed her shawls herself. Safely stored away afterwards with small bundles of cloves wrapped in muslin to keep any kind of bugs away. I am of course not as careful, but still more so than with any thing else… coz she taught me to be. Yes, this has definitely been a trip down the memory lane. Nostalgic yet most enjoyable. Thank you once again. P.S. The math quiz is a nice addition. Laughing! durkha… lovely word. no no, we must get some really pretty ones some day. cloves, hmm… thanks for telling me. Very sweet dear mother and aunt of grown up girls.. am surprised that they had fun and didn’t think of how they looked. Amazes me how comfortable grandmothers are in sarees. Your comment about their blouse reminded me of my American and European colleagues who blushed and wondered how someone could wear a tiny piece of blouse that would leave a bare mid riff. haha I tried my best to tell them the saree covers all important areas, but was not successful in convincing them. hahhah, it’s okay to wear shorts very very short and tank tops and tubes, it’s okay to wear necklines that plunge to the navel, it’s fine to wear tight fitting tiny dresses… but choli? hmmm… how bad how bad. thanks, rhea… i had fun with the posing monsters. i hope my ladki does wear sarees some day. 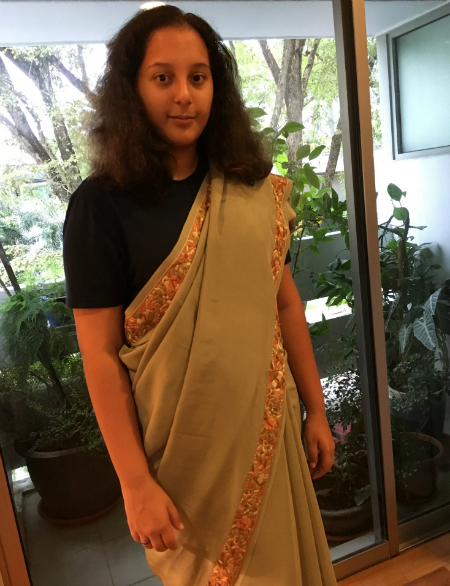 while i love pants and skirts and even long dresses… i think sarees and churidars/shalwars, a girl should never lose… our clothes are so much a part of who we are. when you take someone’s ethnic wear away, i feel something inner and essential also goes along with it. 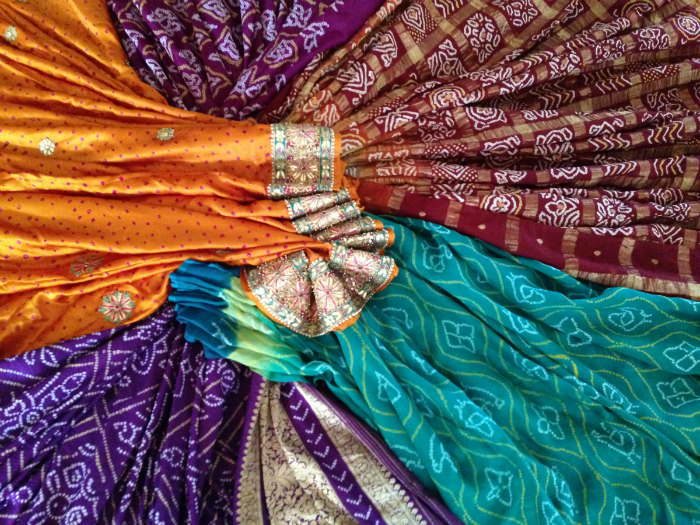 plus i love sarees… sigh.